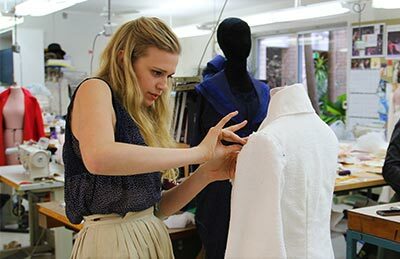 Students are introduced to the techniques required to produce creative works integral to the role of a costume professional, including costume construction, tailoring, pattern making, period cutting, draping, costume management, millinery and leatherwork. The course prepares students for careers as costume supervisors and creators in the arts and entertainment industries, including theatre, opera, dance, film, television and events. NIDA’s Bachelor of Fine Arts (Costume) is an immersive, practice-based course offering education and training in costume construction, management and research in a collaborative environment. Students learn to apply their skills in increasingly complex situations through practical workshops, exhibitions, installations and research projects, as well as undertaking the roles of Dresser, Costume Cutter, Maker and Costume Supervisor for full-scale productions in collaboration with designers and performers. New and non-traditional materials and techniques are explored, and students gain experience of how to manage budgets and supervise a costume department. While the course is focused primarily around costume in the context of theatre, classes, projects and industry placements offer learning opportunities across the arts and entertainment industries. All students spend time in industry placements with leading professional companies or individuals. The tutors for this course are some of the most experienced specialists in the industry providing students the highest quality of training and strong links and networks for when they graduate. This subject introduces students to the skills and knowledge required to produce creative works integral to becoming a costume professional. The learning in this subject forms a foundation that is built upon throughout the course. In order to achieve this students undertake experimentation by dissecting and re-creating female costumes through a study of flat pattern making and construction (both contemporary and period) and draping and moulding on the form. The classes utilise a range of methodologies that may be used to satisfy a broad spectrum of performance genres and industry scenarios. Initial studies are undertaken in the performance characteristics, classification and application of materials that are fundamental to the creation of costume. Students are introduced to research, evaluations and interpretation of information with a view to raising the students’ awareness of the importance of contextualising their work and analysing it within a creative environment. This subject introduces new areas of exploration. Exploratory studies continue in the areas of millinery, flat pattern making and construction, draping and moulding on the form. Within these areas students are now encouraged to begin to form judgments regarding line, form and silhouette. Tailoring techniques are introduced as part of an introduction to an understanding of costuming the male form. To contextualise the costume realisation aspects of the course, the study of costume history is introduced. Studies revolve around the social paradigms and contexts reflected in clothing up to the beginning of the 19th century. Students begin to apply skills learnt in Costume Studio to mount a theatrical production framed within professional conditions. Being part of an interdisciplinary team enables them to gain an holistic view of their own roles and responsibilities and those of others within the production process. For the first time students become cognisant of the need to use appropriate communication methods and terminology pertinent to the different stages of the development of a production. As one of the integral interdisciplinary relationships for the costumier is with the performer, the production process enables the Costume student to learn through an immersive experience backstage encompassing dressing-room etiquette and industry protocol. The students’ Studio work is further contextualised by the realisation of one complete basic female costume component and a millinery work supervised by specialist class tutors. 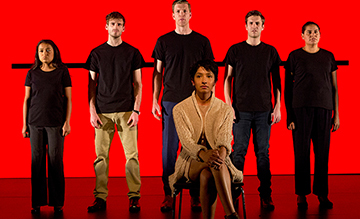 Students join with an interdisciplinary team from within NIDA to mount a new production selected to expand and complement their earlier collaborative experience. Expanding the earlier experience of production and backstage etiquette, protocols and communication strategies enables the students to identify issues and problems as they arise and contribute at a more in-depth level to the overall production. Although students contribute to the costuming of all performers within their assigned production, it is a male performer who is the focus of the making of a completed costume. The tailoring techniques that have been introduced in Studio are utilised to tailor a basic garment for a male performer. In this subject students create costumes through a series of projects at a more complex and autonomous level, managing both their own time and project budgets. These scenario-related, problem-solving activities involve the students making decisions by synthesising knowledge and assuming responsibility for their own creative decisions. Studies in costume history continue focusing on 19th and 20th century clothing including the examination of original garments and investigation of the social and psychological elements that moulded what societies wore and how they wore it. New scenarios are introduced for the research and realisation of costumes. These are chosen to ensure that by the end of their second year students have experienced a broad range of theatrical forms and, through the choice of periods and interpretations, have covered major making challenges and techniques. Students commence study of the implications of costume for screen and use this knowledge to distinguish between the various applications of costume in film and television. Resources and budget organisation now progress into a more holistic study of costume management. collaboration with the designer and performer. Students consult with designers on details of the design and performance requirements of the costume. They discuss and advise the design students as to the appropriate fabrics and construction techniques to be used to make the costume. New and non-traditional materials and techniques are harnessed for use in a project responding to issues of scale and visual impact when making for sizeable venues that differ from the NIDA experience. Experts in fields of the arts external to NIDA are brought in to augment the students’ understanding of the possibilities of collaboration within the wider arts environment. In making a more complex female garment for performance, students expand the depth of their collaboration with the designer and performer. With input from the designer, performer and stage management, students problem-solve issues that arise from the making and rehearsal process. They begin to form independent judgments on scale, proportion, line and detail for the female form in performance. For the first time students have the sole responsibility to translate a designer’s concept into a complete set of costumes for a production. Following theoretical classes and industry case studies, the students progress to comprehending more clearly the complexity and responsibilities involved in working with directors, performers, designers, production and stage managers at a management level. The journeys of discovery continue as students develop and establish the framework for a substantial, mentored research project. This project entails a self-initiated interrogation propelled by the individual students. It enables the students to investigate in depth an aspect of costume or clothing about which they wish to test a hypothesis or gain a greater understanding. Students use their judgment to evaluate the appropriate skills, methodologies and techniques to progress towards their research outcome. COS7301B Costume Studio is the culminating work and presentation for the Costume course at NIDA when the research project commenced in the previous semester is presented publicly. It can be delivered as a dissertation, presented as a creative work or a combination of both. The documentation of the process forms part of the presentation as does the form and manner of presentation. As students of a storytelling medium, the students must present their research and conclusions in an engaging and informative manner. Students take on the leadership role of costume supervisor for a main-stage production, synthesising accumulated managerial, technical and creative learning. 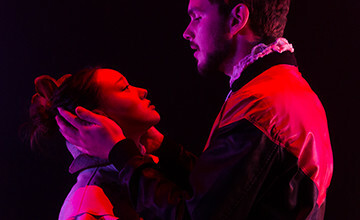 The students engage with other departments in the full production process from initial design consultations through the planning, construction and rehearsal process to technical and dress rehearsals, performances and bump-outs. Oversight of the process includes guidance and supervision of less experienced crew from their own and other courses. Students also co-curate an exhibition or installation within the NIDA environment or extend their collaboration beyond NIDA’s venues and personnel, liaising with external stakeholders to conceptualise, progress and fulfil the brief for the exhibition or installation. Students use their insights into the world of costume to identify the direction of their potential career path and decide an avenue to pursue within the collaborative process. They may choose to supervise a large-scale production with new and differing challenges and personnel or undertake to construct significant male and female costumes, identifying areas not previously addressed within their collaborative experience. Students investigate specialist costumes that could include extreme body shaping, non-traditional costume materials or techniques, costume-props and traditional dancewear such as leotards. This project enables students to interface with a diverse portfolio of stakeholders to understand the varying needs of specialist performance. The purpose of this subject is twofold: firstly, students engage with the non-discipline specific skills and knowledge they will require to successfully pursue careers within a professional artistic environment; secondly, it commences the process of introducing and integrating the students into professional industries, networks and communities. These aims are achieved through a combination of formal seminars, as well as through experiential and immersive learning opportunities within the industry under professional guidance. This semester students deepen their knowledge and expectations in readiness for the transition to professional life, primarily through further industry placements and mentoring arrangements. Students acquire further practical skills and knowledge, whilst also developing a broader contextualisation, understanding and experience of the industry. All these items are to be purchased and labelled with your name prior to arrival at NIDA - an engraving tool is available at NIDA if needed. This equipment will be checked by your Head of Department by 1 February 2018. You should consider your purchases as life-long investments. All tools on this list will be discussed in the first week of study, such that any queries can be addressed at that time. 1 pair of dressmaking shears (good quality ‘Mundial’ or equivalent). Engrave your name on these. 1 grading ruler (inches and centimetres). Can be obtained from quilters’ stores. Most of these items can be bought from Greenfields (02 9212 1944, 30-36 Ann Street, Surry Hills). During the term, additional stationary may be required at your expense. NIDA only supplies stationery for productions. Shortly after arriving at NIDA you will be required to have a set of black clothes for production work (a long sleeved black top and long black trousers). You should also have protective footwear to be worn in the workrooms and theatre spaces. For Costume students this means enclosed, comfortable shoes. Safe working clothing is COMPULSORY when in the workshop area. Closed shoes must be worn at all times in the workshop studios and theatres. Entry to the BFA Costume is by interview. Applicants will need to prepare a project prior to their interview - see below for details or download the BFA Application Guide for 2019. Your portfolio may include photographic or video examples of your art/craft/sewing and costume-related work; documentation of the development process of some items; and documentation of the inside of finished garments. You may upload a digital portfolio with your application; otherwise you can bring one with you to your interview. If you upload a digital version, please also bring along a display or printed copy to your interview. Select a garment pattern from the provided list for your project. Prepare your project according to the requirements and bring it along to your interview for discussion. You should be prepared to spend half the day at your interview (i.e. either the morning or the afternoon). First, there will be a brief talk about NIDA, the Costume course and what will happen during the individual interview. There will be an opportunity for you to ask any questions you may have about NIDA or about the interview itself. Each applicant will then be interviewed for around 30 minutes. During the interview, we will discuss your garment project, your portfolio and costume related work. We will discuss these with you to learn more about your background, abilities, interests, aspirations, and why you wish to study Costume at NIDA. You will also undertake a short sewing test following a set of instructions. NIDA will provide all the equipment you will need for this. You will be asked to write a short response to an image or costume provided at the time. Preparation! The more time and effort you put into the projects and interview preparation in advance, the more confident you’ll be and the more you will benefit from the interview and discussion. Come with a clear idea of why you want to study Costume at NIDA. Please contact NIDA if you are having difficulty obtaining a pattern. Make a garment for yourself, a friend or family member using one of the patterns listed. Make the pattern as it exists - please do not alter the basic pattern unless it is for the purpose of a better fit. You may use any fabric or combination of fabrics, decoration and finish that you wish. Please do not spend a great deal of money on your materials – we will be looking at your creativity and technical skills rather than the value of the materials themselves. Interpret the design in any way that you wish within the limits of the given shape. Photograph the garment being worn by the person for whom it was made; styling is encouraged. Bring the garment to your interview well pressed, in a garment bag or plastic covering and on a coat hanger with your name attached. Only send the garment in advance if you are having a video interview, with the photos included. The garment project is an important point of discussion at your interview. NIDA is, of course, particularly interested in viewing the finished quality of what you present, but remember, skills can be developed by practice and guidance and NIDA will provide these if your application is successful. Costume students create a wide range of costumes for performance. As a graduate of the Bachelor of Fine Arts (Costume) you will have the necessary skills and knowledge required to succeed across the multidisciplinary field of costume making. Katherine is an emerging screenwriter from Brisbane. She first made her mark at the age of 16 when she won the title of Girlfriend Magazineʼs Teenage Blogger. 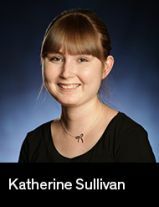 Over the years, Katherineʼs passion for writing grew and she graduated from The University of Queensland with a bachelor of Communication/Arts in 2016.